"I thought, while I'm here, if I'm not busy, I'll go sell Girl Scout cookies," says 10- year-old Elyse Pineda. Evelyn Pineda, mother of Elyse, adds, "She's a regular gastrointestinal patient, so we're in here a lot. She has an intestinal pseudo- obstruction, and we're here this time because she has abdominal pain. UCLA is like our second home; a lot of people know her here, so they might as well buy their cookies from her. 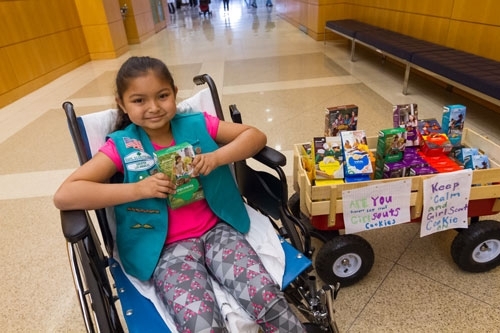 The rest of her troop got to start selling on Sunday, and she didn't want to be left out, so I brought in all her cookies." Elyse nods, and says, "'Sometimes people just come up to me, and sometimes we make the people come to us. My favorite cookies are thin mints.'"